GLORY’s Last Man Standing PPV event takes place on June 21st, directly following GLORY 17 Los Angeles on Spike TV. 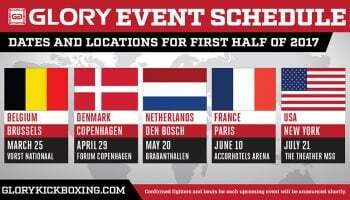 The event is set to already crown two champions for GLORY; Rico Verhoeven vs. Daniel Ghita will compete for the GLORY Heavyweight Championship and the Last Man Standing tournament is for the GLORY Middleweight Championship. Now it looks like Marc De Bonte will have his first GLORY Welterweight title defense as well, this one against Joseph Valtellini. This was a fight that De Bonte specifically asked for at the GLORY 16 post-fight press conference and should be an interesting clash of styles. De Bonte is a more calculated and technical fighter while Valtellini tends to err more on the side of throwing big strikes while remaining technical himself. GLORY’s Last Man Standing event should really be explosive, with three world title fights.